I took this picture out and about in my neighborhood. I saw this scene a couple of weeks ago and didn’t have my camera. I happened to pass by yesterday and was ready this time. Do you love what I love about the owner of this little blue scooter? I am believing that the owner is a hip chick. She buckles her helmet and takes off on her journey. a vessel to hold necessary fuel. find her tiny tank empty. enter the quart of oil. smooth because of the oil. Otherwise, it is just a lot of metal and rubber. I don’t know what verses come to mind for you. Maybe not one and that is perfectly fine. lodged in my brain waves. It’s not about us people! It’s all about the surpassing power that allows us to be illuminated! "But in your hearts revere Christ as Lord. But do this with gentleness and respect,"
Tell them about the fuel. Tell them about the anointing oil. Spirit coursing through your veins. Oh Helen, this is brilliant! Your message is so powerful. 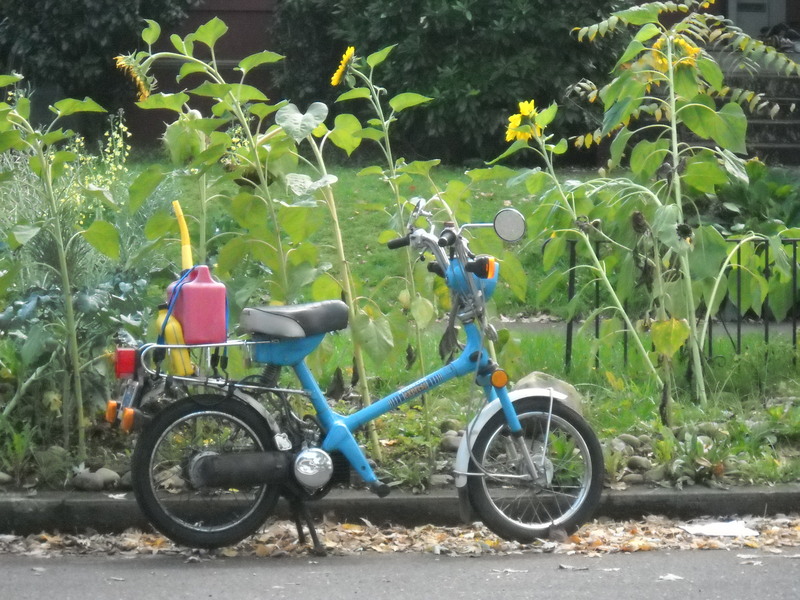 I want to be like this little scooter: useful and effective: worn…yet somewhat stylish; and prepared in season and out!